As a rare snowfall blanketed Vancouver, chants and drumbeats greeted federal regulators and petroleum industry representatives. 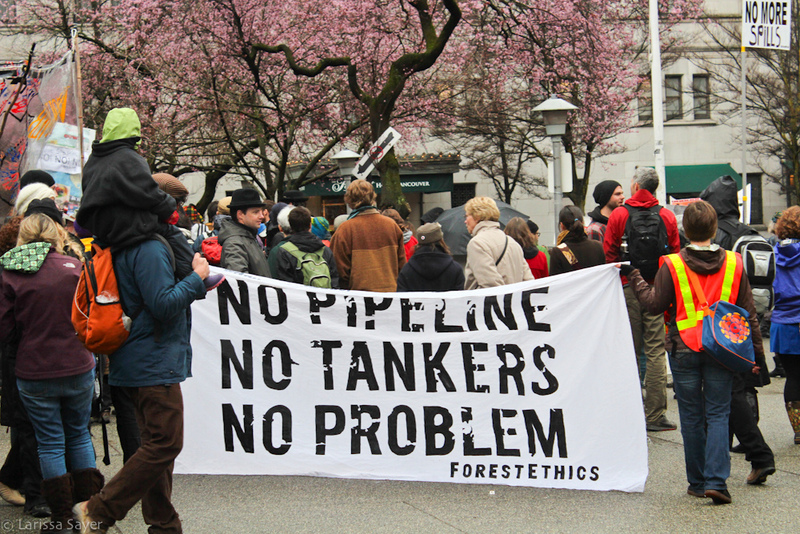 Thousands of protesters gathered to show their opposition to the Northern Gateway Pipeline. There have been demonstrations at closed community meetings throughout British Columbia since talks began in January. The proposed Northern Gateway twin pipeline would carry bitumen from Alberta’s oil sands to Kitimaat on Canada’s Pacific coast. Enbridge, Canada’s largest oil and gas transport company, is sponsoring the $6 billion project. The proposal includes a refinery to convert the bitumen into oil. If completed, the operation could produce up to 525,000 barrels of oil per day to be shipped to growing Asian markets in particular China. Since Prime Minister Stephen Harper’s Keystone XL talks with the United States are dragging on, Canada is trying to generate new markets for its crude oil. China, the world second largest economy, is interested in Canadian natural resources to satiate its increasing energy demands. The International Energy Agency (IEA) forecasts that China’s energy demand will grow 75% in 2035, accounting for one-third of global consumption growth. The Chinese government is actively searching for sources to meet this substantial increase. Evidently, some Chinese oil companies are considered as the biggest potential buyers of the Northern Gateway Pipeline project. It is not a secret that China is eager to purchase Canadian oil and gas. China National Offshore Oil Corporation acquired Nexen, a Canadian energy company, for $15 billion in December 2012 and China holds large investments in many companies in the petroleum industry. On the other hand, with the increasing energy appetite come cries from China’s burgeoning green movement. Environmental issues are a hot topic on social media and “PM 2.5” is trending on Weibo, the Chinese Twitter. PM 2.5 refers to air particles so small that they can penetrate the lungs. A high PM 2.5 indicates very low air quality and can cause respiratory and cardiovascular illness. Many citizens are concerned about air quality because of the high pollution levels in many Chinese cities. In January, Beijing’s air pollution was off the charts, registering at 755 according to the US embassy. The scale usually stops at 500 making it is one of the highest measurements of all time. Other kinds of environmental problems like water and garbage pollution are also great challenges for the new leaders. Recently, the Chinese government has paid more attention to environmental issues. They are using more clean technologies and advanced environmental management approaches. An Australian study showed that China is a world leader in green energy. It is also a pioneer in international cooperation efforts including a partnership with South Korea and Japan to combat air pollution. As China is becoming serious about climate change and green energy, the world’s attention will focus on China and how this rising star will balance environmental policy with higher energy demands. Conflicts between public opinion, economic interest and environmental awareness are occurring on both sides of the Pacific. In 2011, protests against a PX factory in the city of Dalian forced the city government to close the plant though it reportedly re-opened later. On May 4, 2013, Kunming, in southwest China, witnessed mass protests against plans to build a factory producing a toxic chemical for the textile industry. Some demonstrators came prepared with banners and face masks printed with a no-entry sign over the letters PX. Chinese president Xi Jinping mentioned “the great revival of Chinese nation” last November in a speech at the national museum of Tienanmen Square. He declared that meeting the Chinese people’s desire for a happy life as his government’s mission. China’s global influence is expanding and many economists also predict that China’s economy will overtake the United States in the coming decades. This economic explosion is changing how Chinese people interact with the natural environment. The Chinese government has two development strategies to guide its environmental policies: harmonious society and recycling economy. There has been early success for China in the environmental management field. Perhaps the Kunming Project will be cancelled, but will they do so to quell citizen demands and quietly open the factory at another location? Some experts consider the Northern Gateway Pipeline Project to be a dilemma of economic development and environment protection. Dr. Tongbo Kang, an executive Chairman of one large company in China as well as a permanent member of Environmental Protecting and Energy Saving Association in Beijing urged both Canada and China to carefully balance profit with potential negative side effects to the environment. As Chinese opinions vary, public opinions are also divided in British Columbia. Similar to the Chinese protests against the Kunming PX project, Canadians are notorious for protesting against proposed projects that would damage the environment. The government is so frightened of environmental groups that they are subject to monitoring by police and security forces like terrorist organizations. Many Canadians hope for environmentally sustainable economic development. However, it is hard to find a balance point between the environment and economy benefit in times of financial crisis. Enbridge and Alberta have promised BC $600 million in revenues and 8,500 full time jobs during the construction phase. The increase in energy availability may also lower high fuel prices in Canada. However, many BC residents remain on the fence. Northern Gateway is under scrutiny for its environmental risks from many groups including academic research. Last week, a study published by Simon Fraser University found that there is a 90 percent probability of a tanker oil spill. Another study by the University of British Columbia indicated that the cost of an oil-spill would be $9.6 billion wiping out any profits to be gained from the project. Enbridge challenged the validity of the findings of both studies. There is also the issue of First Nations sovereignty. Land treaties signed between BC, Canada, and Aboriginal nations give First Nations relative autonomy over land use. The proposed pipeline route cuts through many traditional territories so Enbridge is dependent on the approval of First Nations groups. Recently, Coastal First Nations whose jurisdiction includes the proposed port of Kitimaat have withdrawn from the consultation process citing a lack of funding and faith in the project. First Nations group are further filing constitutional challenges to the review panel claiming that it infringes on their constitutional rights. For now, the future of the Northern Gateway Pipeline remains uncertain. Mounting environmental pressure in Canada and China as well as divided public opinion are challenging politicians on both Pacific coasts to cautiously tread forward. China’s new government has yet to take an official stance. The issue was a hot topic in this week’s BC elections with the pro-pipeline Liberals winning another term in office. Only time will tell if Chinese citizens and BC residents are willing to take this risk.